Pakistan is popular for Himalaya expedition. 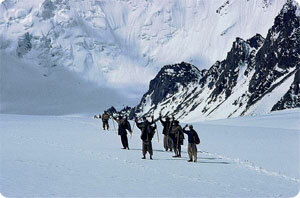 Pakistan has the largest concentration of high mountains in the World. There are more than 100 peaks over 7,000 meters (23,000 feet) are within a radius of 180 kilometers. Mount K2 8611m , Nanga Parbat 8,126m, Mt. Gasherbrum I 8086m, Broad peak 8,047m Gasherbrum II 8,035m are main popular mountain in Pakistan. The Karakoram, Himalaya, Hindu-Kush and the Pamir. These Mountains are the walls that form Pakistan's long and carefully guarded frontiers with China, India, Afghanistan and across the narrow Wakhan Corridor towards Central Asia. The Karakoram and Himalaya are the newest mountains in the World. About 55 million years ago, the northward drifting Indian geological plate collided with the Asian Plate, its northern edge nosing underneath the Asian Plate and pushing up the mountains. The five above 8,000 meter peaks out of the World's fourteen (14) 8,000 meter peaks are in Pakistan. Peaks above 3,000 to 6,000 meters are countless and remain unclimbed and unnamed. Out of 100 highest peaks in the world, more than 50 are in Pakistan. Himalaya Journey Treks & Expedition ,Nepal arrange the all Himalaya expedition in Pakistan according to client desire and holiday schedule.